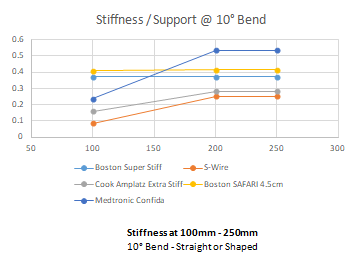 The chart to the right is a comparison of the bending stiffness of various guidewires commonly used to deliver TAVR valves. As Valve Delivery Systems (VDS) have become lower profile and more flexible, the necessary degree of guidewire support has decreased. The S-Wire is slightly less stiff than competitors by design; yet still offers sufficient stiffness to deliver the VDS. The S-Wire can be supplied in a Bulk Non Sterile (BNS) or sterile, packaged and labeled configuration. 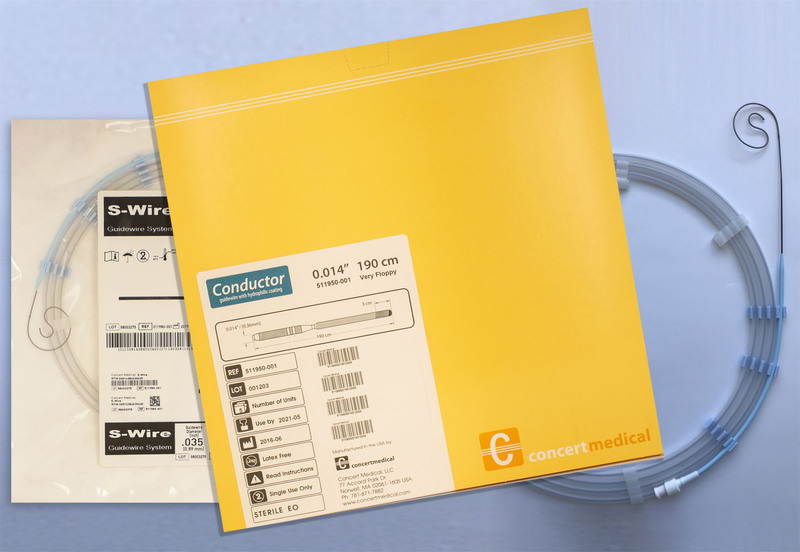 The sterile S-Wire packaging configuration is 5 pouched wires per box. A preloaded wire straightener is included with the packaging. The tapered distal end of the wire straightener makes it quick and easy to advance the S-Wire into the proximal hub of a catheter positioned in the left ventricle. As the wire is advanced out the end of a catheter positioned in the left ventricle, the distal portion of the wire initially curves in one direction. Once the distal 10mm of wire is advanced, the distal curve of the wire then abruptly changes direction 180 degrees.